Sesame Street is turning 40 this week, so consider these Sweets a few virtual birthday cakes for everyone's favorite Street. I think these cakes are amazing. It really shows how much people love Sesame Street. I was just thinking how awesome a Bert and Ernie wedding cake would be and then I remember that my sister played "But I Like You" at her wedding. I recommend finding the lyrics online. I think I was the first generation to grow up with Sesame Street as I am 44. Of course, I did not realize it at the time. These wonderful cakes bring a nostalgic tear to me eye- thank you! 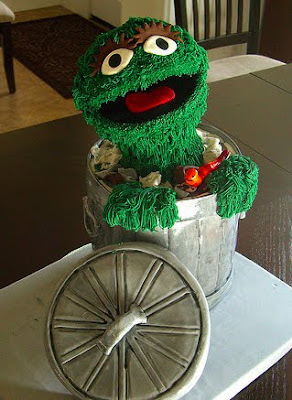 I completely love that Oscar the Grouch cake! So adorable! My not-quite-two-year-old son looked at the Big Bird cake and said, "Whoa. Dat big." These are some of my favorite cakes you have featured. I can't even pick a favorite! I think this is my favorite Sunday Sweets. While the steampunk stuff was AWESOME, this one is just too adorably sweet. That oscar cake is freaking awesome and deserves accolades. What happens when your bra gets smashed flat when you're packing. aieeeee, I love it! The baby Cookie Monster is adorable, and the last one is nothing short of astonishing! Wow!!! That last cake is truly amazing! And the rest are sooo sweet! I never realized before you started posting about Sesame Street that it's only one day older than I am!! I love Sesame Street! These cakes are so amazing. I'm always astounded by sculpted cakes, All of Big Birds weight is balanced entirely on one leg in that one cake, it boggles the mind. The Count always scared the crap out of my little sister. I wonder if, in our mid-30s, I could terrorize her by serving her this cake? ;) I wouldn't do that. Jen: you must look at target's sunday paper ad today. (it's on sunday saver.com) *target* is now selling its own CCCs -- and they're pretty wrecktastic. See, that's why Mike McCarey does so well at Challenges compared to so many others, because he DOES practice and do full cakes in advance. It drives me batty when competitors whine that something didn't work because it's the first time they ever did it (unless the competition had a required mystery element, but even then, you don't try new techniques for the first time at Challenge). Mike McCarey = CAKE GOD. And Lauren Kitchens was pretty amazing at that Challenge too. They're soooo adorable! I want them all. My favorite ones are the letters, definitely. 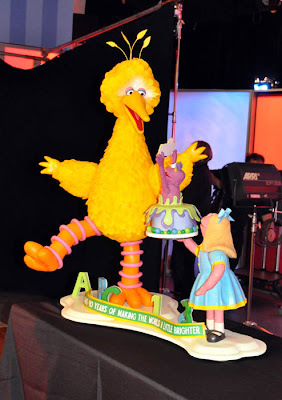 :O How the holy heck is the big bird cake standing so well on one foot??? Seems like defying gravity. :p At least to me anyway. :D All are AWESOME of course! I posted some of my favorite Sesame Street songs on my Facebook page the other day to celebrate. my daughter would be disappointed not to see a grover cake though. he was (and still IS, at her ripe old age of 27) her very favorite. And I missed that particular Challenge episode. How the heck did he get that really big Big Bird balanced on only the one leg? Amazing. Oscar is my favorite character. *sings* Oh I love trash! I love it because it's trash! Ooooh! I LOVE the Count cake! And that fondant-free one is fantastic! I realize I am in the minority when I say that I did not care much for Sesame Street while growing up (in the late 70's). I was more of a Muppet Show-type of gal. But now that I have a little girl, I have come to fully appreciate the joys of Sesame Street. The Miller cake is one of the cutest I've ever seen. I wish I had a bigger picture of it! All of these cakes make me smile. I'm so glad that Sesame Street has made it to 40. The first one is so adorable!! Definitely my Favorite! How much of that last cake is actually cake and/or food-like substances? i saw the challenge with the Big Bird. It is pretty real looking and must have been fantastic in real life. He won but the monster in his cake is his own creation and he got in trouble with the judges for this. I thought he could have put horms on it and called it a honker. this weeks' Sunday Sweets makes me soooooo happy!! This comment brought to you by the letter "J." A couple of days ago you posted an entry with terrible Big Bird wrecks. And then you posted a link of Big Bird on Hollywood Squares. This inspired me to click the related videos over to the side in You Tube. http://www.youtube.com/watch?v=lrZyMptC2eQ "Big Bird at Jim Henson's Memorial." I suggest that you don't click any other suggested videos or you'll cry even more. my cake-obsessed 5yo loved looking at all the cakes, thank you for posting them as you've totally made my Sunday :-) Awesome, awesome, awesome!!! I actually saw that show on food network, it was really amazing! I love watching them making them and sometimes them falling apart while transporting...The count is my favorite character, but they did a great job on the Oscar cake too! Love it how Sesame Street has now spanned 2 generations. My kids are in the other room watching it right this very moment! Love it that they get to grow up with a show that I remember loving as kid! And it's still one of the best kid's shows on TV! Happy Birthday Sesame Street! I actually saw the Food Network Challenge segment when they were making the cakes, and they were all so good! My favorite of the ones that you posted would have to be the first. So cute! My 2-yr old saw that last cake and said, "Mommy look. Big Bird!" All winners in our house. Thanks for the amazing Sesame cakes. Oh, that Oscar cake is the best! I remember Mike's cake from the challenge. If I remember correctly, Big Bird is mostly rice krispie treats with armature underneath. But it is food stuffs. He did a really amazing job. First time i listened to this was in a car I was driving. Baaaad mistake. RainX doesn't work for this type of waterworks. These cakes are just too cool!!! 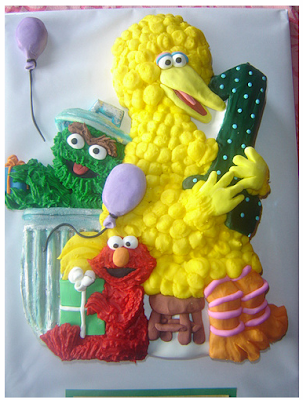 Wow, amazing is certainly the operative word for the Big Bird cake! I really like the fondant-free and Count ones, too. Still, I have to agree that Mike McCarey is just amazing to watch, and his Big Bird cake totally deserved the win. and love that Count cake!!! As for these cakes today--W-O-W! I don't want to cut them up any more than the Bird Birds from the other day, but for entirely different reasons. These I want to preserve for display on the mantel or something. No, Baby Cookie Monster was NEVER on Sesame Street. He is part of the annoying cutesy wootsy trend to make "Baby" characters of popular cartoons and kids shows. I think it started with "Muppet Babies"., which at least had some hidden grown up humor in there, now and again. No we have baby Warner Brothers, Baby Disney, Baby Sesame Street and more baby Muppets, baby Winnie the Pooh (see Disney, or they'll sue!) It's truly sickening. Next up, "baby" other things. I can see it now. Baby Pokemon, Baby Lord of The Rings, Baby Spider Man, Baby X-Men, Baby Desperate Hosewives, Baby Midnight Cowboy. Wow, those are all fabulous. I love the name spelled out with character letters! Quick, someone do "Melissa"! 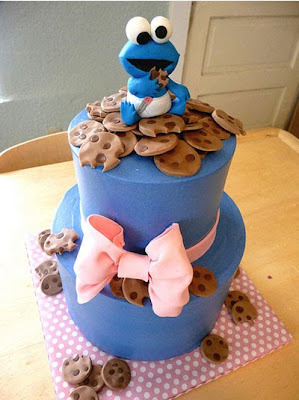 The Cookie Monster cake is absolutely adorable! I wouldn't even want to eat it! Oh golly! I share a birthday with Sesame Street? I had no idea! captcha word is "morsel" As in "I'd be perfectly happy with a morsel of one of those cakes. Big Bird's toe, please!" Awesome! Best Sunday Sweets ever! I just love them all, and I love Sesame Street. I'm glad Prairie Dawn made it because I find her to be highly underrated. But yes, where's Grover? He was always my favorite. I wonder if anyone's ever done a "One two three FOUR FIVE six seven eight NINE TEN eleven twelve" cake? Any takers? WOW...these are awesome. I love Sesame Street! It looks like he (Mr. McCarey) changed the final character popping out of the cake. It's so nice to see such beautiful tributes to an iconic show. These are all amazing! I had a Cookie Monster cake for my second birthday party. (You know, just a few years ago..lol). Those cakes are wonderful. The Count cake is awesome---I don't think he gets enough love. He's definitely a cuter vampire than that sparkly you-know-who and he's pro-education! I'm 33, and sometimes I still sneak a peek at Sesame Street. I grew up watching the show and it's great to see it's still on the air, inspiring both little kids and big kids too. Every time I see Sunday Sweets, I am amazed at the art that comes from sugar,icing and cake! This is my favorite Sunday Sweet yet. Great post! Those cakes were all so gorgeous. I couldn't pick a favorite. I'm 40 and I would be thrilled to have any one of those as my 41st birthday cake. Too cute! The one for Miller was SO creative!!! When I was very little I was obsessed with Oscar the Grouch. Really obsessed. I would only answer to the name Oscar and I would take the trash out of the kitchen trashcan and try to climb in. Needless to say, the Oscar the Grouch cake warms my cold, grouchy heart. I was also a big fan of The Count and Bert and Ernie. Hated Big Bird (the Big Big Bird cake is cool, though). The Count was adorable. He just doesn't get the love that he needs. I'm 34 (I guess first/second gen Sesame Street) and loved how counting was so much fun with the Count. These cakes are awesome and looks yummy too. =D Thanks for sharing and more birthdays to come Sesame Street. That Count cake is completely fantastic. Have you ever seen the youtube of the "censored" Count? These cakes made me go back and watch it...repeatedly. Those are the cutest frickin' cakes ever! Big fan of Cake Wrecks, and I always look forward to Sunday Sweets. So surprised to find one of my own creations featured when I checked todays post. Thank you for the recognition. By the way I did this cake for my little guy's fourth birhtday. He is a BIG fan of Count von Count. We even named our puppy Countess von Cupcake. I want that "The Count" cake. Except I want it in permanent-display form. I had to wipe a nostaligic tear away after seeing these wondeful cakes. Mike's cake was amazing, but if anyone is a fan of Challenge, they would have to appreciate the silver medal winner in that competition. I'd also like to see Bakerella get some sunday sweet love, as she has made the most adorable Sesame Street cake pops this week! wv: dealamin- to put off briefly: "Ima hafta dealamin on gettin' you that answer, bud." These are all just too beautiful! "S" is for Sesame Street! How proud am I that Mike made my simple little wedding cake almost exactly ten years ago? He's fantastic! And the cake was yummy. . . Marrionberry filling! And I thought that my Elmo cake for my son was awesome... These make me feel bad for myself, they're AMAZING!!!!! Just so you know, the time change has really messed with my schedule. The absolute first thing I always did in the mornings was to check "Cake Wrecks" to get a good laugh for the day. Now I have to actually fix breakfast, make the bed, read the paper (which does not make me laugh) and THEN I get some "Cake Wrecks." My world is out of balance. Thank you for providing many, many laughs for us. There was an episode where someone (I think his mother) sends him a watermelon for his birthday. The Count spends quite some time trying to figure out why she would only send him one watermelon when she knows how much he likes to count things. Giving up on this question, he picks up the watermelon to take it home and promptly falls over. Then picks it up and falls over again. This is the point where he figures out that the idea was for him to count how many times he falls down trying to get the watermelon home. How could you NOT love The Count after that?? These are some of the most adorable Sweets I've seen! I'm also thinking that the Count cake would be especially good for when you've been hiding your age for the past 8 years. WV: phest. The baby Cookie Monster cake was present at a phest of cuteness. i'm totally gonna get the baby cookie monster one for my next birthday! I LOVE cookies and cookie monster. That cake is too awesome! All the others are great too-but seeing a cookie monster cake totally made my day! Thanks! Just to answer your first question, YES! There have been baby muppets in the past! Remember in "Muppets Take Manhattan" when Miss Piggy falls asleep on Kermit's lap on the horse carriage ride? And she drifts off to "back in the day" when she and "kermie" were babies? and she and kermit sing a song together with all of the other muppets when they were babies in the nursery? 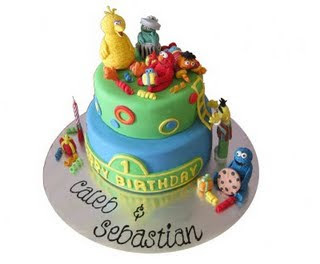 What Great Sesame Street Cakes! I have tried an Elmo or two but none this good!! Well that does it - I'm getting married just so Mike's Amazing Cakes can make me a Muppet/SS wedding cake. WV: bibrep - the guy who sells me the shirt-splatter-guards before I dive into the delicious cake! I totallyyyyyyy had a Sesame Street cake for my 1st birthday. Old School! Not to be a downer, but the last cake in this post has a monster not in Sesame Street. The cake artist created the new monster named Jellybean. Its still cute. I love the cookie monster cake it's my favorite! I cannot get over how adorable that baby cookie monster cake is. It's amazingly cute!!!!! I'm definitely going to have that cake for my baby shower! thanks! I used to wear green Oscar the Grouch jeans in kindergarden. I don't think I ever got cake on them. Although I may have gottn cookie on my Cookie Monster shirt. Is it just me or did I just lose the game because of the Count? Why! Why must they put 4 and 7 together like that! Anyways I just love Elmo, Ernie, and Bernie. I want to be able to make a cookie monster cake too! that cookie monster is so cute! and the one with all the characters obviously had so much work go into it... look at all the details! Was looking for some great 1st birthday cake inspriration and now I know I won't be making my own. They are amazing! I can't believe the last one is a cake, how do they get big bird to stand up like that? I saw that episode of Food Network Challenge, and it was sooooo cool!!! 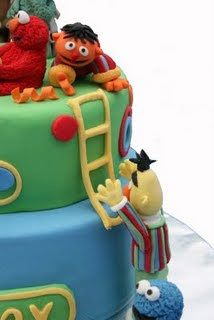 I've loved Sesame Street since I was a kid, and those cakes came out amazing!!!! 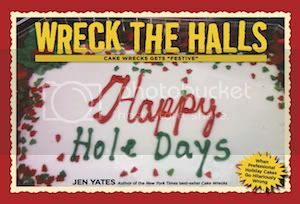 I love the Cake Wrecks book. I got one of my coworkers addicted to it. Him and I laughed so hard at the cakes. Four people have seen the missing character. Where is Grover on these cakes? I wouldn't even mind a wrecked Grover cake!! Why do kids want Elmo? Why am I ranting about cakes and Sesame Street? WHY!?! ...well, I feel better now. Great cakes! I wonder where can I find the person who makes those fabulous cakes! i think it's from the episode "elmo visits the plastic surgeon in the dark alley"
luckily, these sesamelicious sweets reminded me what elmo looked like again and stopped my screams of horror. thank you!!!!! oh and im writing this comment on a phone so i couldnt post a link i could only post the url, sorry!